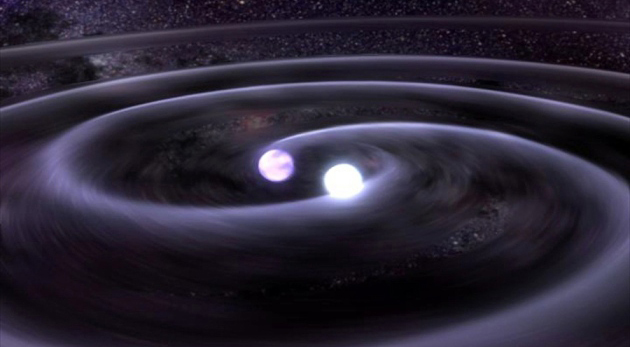 What does the Discovery of Gravitational Waves Mean for Us? We are just now beginning to detect gravity waves that were recorded for the first time by scientists at the LIGO (Laser Interferometer Gravitational-Wave Observatory) program. Physicists with The LIGO Scientific Collaboration team have concluded that the gravitational waves which were detected were likely produced by the dynamic merger of two black holes. Gravitational waves in spacetime were also predicted in Einstein’s Theory of Relativity that gave us a new understanding of gravity as a force that could “warp” spacetime. His theory further predicted that all interactions between bodies moving through spacetime cause energy to be dispersed in gravitational waves which are being seen today. The gravitational waves do not interact with matter but move ‘through’ matter causing a ‘distortion’ of the spacetime in which it is embedded. For years, these ripples in spacetime remained a theoretical construct, widely debated by scientists, because they are extremely difficult to detect with our equipment. For example, the ‘distortion’ created by the gravitational waves resulting from a collision of two black holes ten times larger than our sun would be much less than the width of a proton by the time the ripples first reached earth billions of years later. The waves that were recorded by the LIGO program are considered to be from the merging of two black holes producing a single black hole, 21 times the mass of the sun. Specifically, on September 14, 2015, mismatched light waves were recorded as a “signal” at two observatories in the USA (one in Livingston, Louisiana and another in Hanford, Washington). The 4-km LIGO interferometers that recorded the waves use laser light separated into two beams that travel back and forth down the long arms of a 1.2-meter diameter tube, kept under a near-perfect vacuum. There was a 0.007-second (7 milliseconds) delay between the signals being recorded at both Louisiana and Washington. The oscillation or signal sweeps ranged from 35 to 250 Hz, lasting about 0.25 seconds. 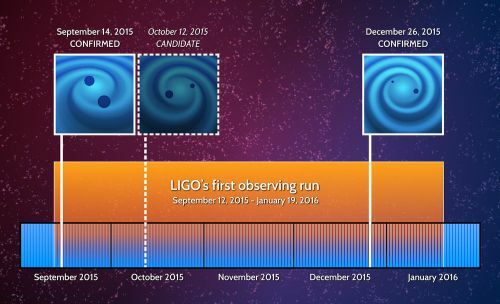 Since that first detection on September 14, there has been the detection of gravitational waves from a second event (December 26, 2015) by both LIGO detectors. It can perhaps thus be said that these disturbances in spacetime are now firmly on the map! According to Einstein’ s theory of General Relativity, the distance between the mirrors will change by an infinitesimal amount when a gravitational wave passes by the detector. It was expected that gravitational waves reaching the earth would affect our planet. When a gravitational wave passes, the compressing and stretching of spacetime stretches one 4-km arm while compressing the other, changing the distance the light has to travel. Scientists measure this interference in the light’s pattern, as any significant mismatch may reveal the presence of gravitational waves. The Keys of Enoch® tells us “The modulation of gravitational waves can be used to overcome the time-lag of electromagnetically based civilisations… There must be a move away from electromagnetic waves to gravitational waves.” (Key 216:27). The Keys further points out that advanced communication technology can also emerge from the modulation of gravitational waves, even with that which is beyond our physical dimensions, as string theorists tell us that gravity may be the one force that exists beyond our “brane”. With these confirmations of the existence of gravitational waves we are now poised to begin to learn more about the structure and nature of our universe. We can learn more about its hidden dimensions and perhaps eventually even the “far out” notion of “time travel”, at least from an observer’s perspective. With new types of detectors, we will be able to study those aspects of the universe not accessible to examination by our current methods that use electromagnetism. We will at last be able to see further back in time to the very early universe and study the mystery of dark matter, dark energy and black holes. The universe will literally begin ‘to speak’ to us! The best-fit models of LIGO’s gravitational-wave signals are converted into sounds. The first sound is from modeled gravitational waves detected by LIGO on Dec. 26, 2015, when two black holes merged. This is then compared to the first-ever gravitational waves detected by LIGO on Sept. 14, 2015, when two higher-mass black holes merged. This sequence is repeated. The pitch of both signals is then increased, allowing them to be heard more easily, and this sequence is also repeated.